The London Art Fair is one of the biggest art festivals in London that displays the world’s finest artworks every year. Artists from all over the globe meet for one of the most renowned art festivals in the country. Galleries based in five continents converge in London to showcase their greatest works to the public. In total 131 exhibitors of fine art help to contribute the jewels in their many different collections. The festival has been hosted at the Business Design Centre since its inception. The event has taken place annually for 30 years now and sees no signs of ending any time soon. 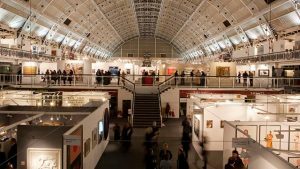 Over the years the London Art Fair has given up and coming artists the chance to show the world their best efforts. In doing so it has helped to establish some of the most well known names in 20th and 21st century art. There is something for everyone at this festival. It combines some of the finest works of the past with the very latest in modern and contemporary art. It is an event that is ideal for families. Adults will appreciate seeing some of the most popular paintings in the world. Children will reap the educational benefits of being exposed to such important cultural artifacts at a young age. It may even spark their imagination and creativity, getting them interested in making art of their own. Paintings, sculptures and photographs are just some of the fascinating and creative works available for public view at the event. There are also award ceremonies such as the Rising Star that rewards the biggest talent among young artists in London today.